This item has been downloaded 629 times. "C1-10P, commonly known as "Chopper," was a C1 model astromech droid with masculine programming who was active in the early years of the Galactic Empire. His master, Hera Syndulla was a member of a resistance movement opposing the Empire. By five years prior to the Battle of Yavin, most of his original components had been replaced by second hand parts. 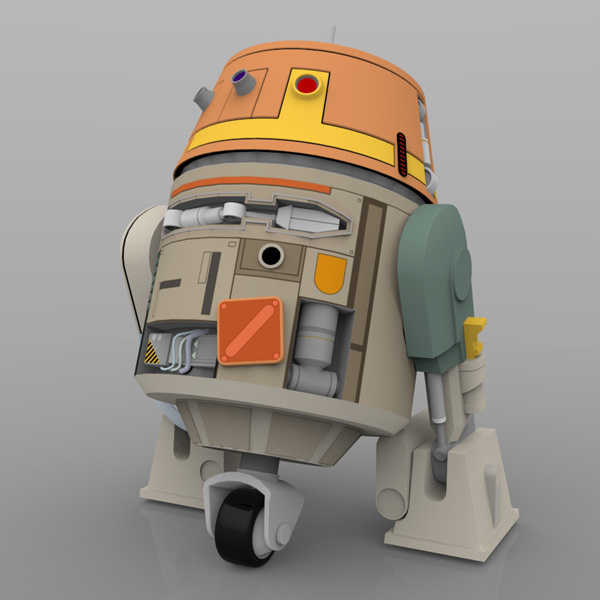 C1-10P appears in the animated television series Star Wars Rebels, which began airing on Disney XD in fall 2014. His appearance is directly inspired from concept artist Ralph McQuarrie`s original Episode IV design sketches for R2-D2." • One DAZ Studio prop: dsf, duf/ png, with x polygons. 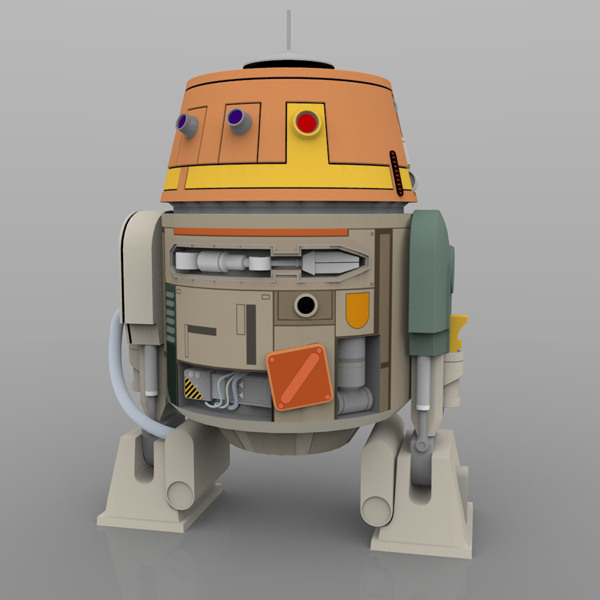 • Scaled to the Poser/ DAZ people, roughly 3/4 the size of the R2 Astromech Droid. - Head can rotate, with an ERC dial on the Body. - Head periscope can move up/ down (with an ERC dial on the Body) and rotate. - Side legs can rotate. - Side feet can rotate. - Side wheels can extend and retract. - Middle leg can extend and retract. - Left and right "head" arms can be positioned and the claws can open and close. - The center "body" arm can be positioned and the claws can open and close. • Standing: body and side legs straight, wheels retracted, middle leg retracted. • Moving: body angled, side legs back, wheels out, middle leg extended. • One color scheme with texture maps. Model by Richard Duda, Poser and DAZ Studio clean-up and rigging by JHoagland.